The Bulky Ribbed Hat on its own and a closeup on my head. © Sarah E. White, licensed to About.com, Inc. 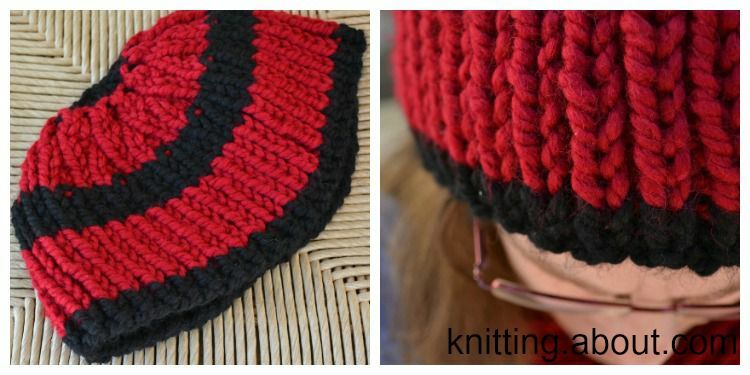 This bulky ribbed hat is a lot of fun and quick to knit. It's not exactly snug, but not exactly slouchy, either. It will still keep you plenty warm on cold days. If you prefer a more snug fit, cast on 80 or even 76 stitches; the ribbing will stretch to fit as needed. As knit, the ribbing does not stretch and looks almost like Stockinette Stitch. Knit this hat alone or knit it with the Ribbed Striped Scarf and Bulky Ribbed Mitts for a bold trio. Altogether these projects use two balls of the main color and less than one ball of the contrast. Using the contrast yarn, cast on 84 stitches. Join in the round, being careful not to twist stitches. Work in knit 1, purl 1 ribbing 1 round. Change to the main color and work in ribbing 2 inches. Change to contrast color and work in ribbing 1 inch. Change to the main color and work in ribbing until piece measures 5 inches from cast on edge. When it comes to shaping the crown, you have a couple of options. You can decrease in pattern, keeping it as close to k1, p1 rib as you can, or you can just work it all in Stockinette. I actually did some of both, working the section in red in rib and the black portion in Stockinette since it's so short and you can't really see the difference. One option is to decrease the size of the crown by decreasing the number of stitches every other round. You start with a work 4, work 2 together around, then work the stitches of the next round as they present themselves, which will not exactly be 1x1 ribbing. Work 1 round as you see the stitches. At this point, you can switch back to the contrast color and to Stockinette. Knit the next round, then knit 2 together around twice. Cut the yarn and thread it on your yarn needle. Slip the remaining stitches onto the yarn and pull tight.